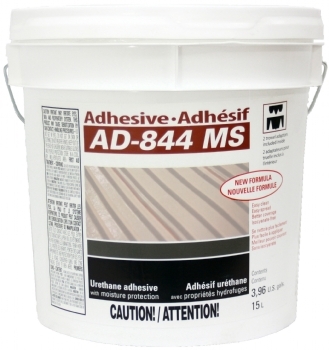 AD-844 MS is an hybrid-polymer-based wood-flooring adhesive. It provides excellent sound-reduction and moisture-controlling properties. Therefore, it provides a superior bond as well as protecting wood flooring from moisture vapour emissions coming through concrete slabs in a single application. Use it for adhering solid hardwood, exotic wood, engineered wood and bamboo. For sound reduction and vapor barrier protection to floor assemblies.